Fancy dark bay Hanoverian gelding with chrome by Gadget (Gesandt/Gaspano/Aristides) out of the Main Studbook mare by Graf Top II. Correct conformation, lovely movement, auto changes and excellent scope over fences. 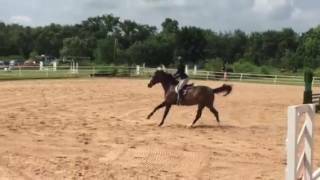 Shown on the line as a yearling and locally in the 2'6"-3' hunter divisions with a junior rider. Has an in your pocket character and is a farm favorite. AHS Certificate of Pedigree, Lifetime USEF, USHJA, THJA. Eligible AHS Annual Performance Awards.